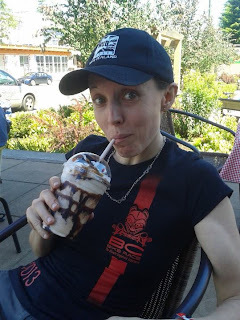 I had anticipated writing a pre race blog way before the 7th edition of BC Bike Race kicked off. Trouble is I was having way too much fun exploring North Shore to fit it into the schedule. It takes some effort to travel pretty much anywhere from New Zealand. I have to say, Canada is well worth that effort. This is my first trip to North America and I am absolutely loving the experience. Coach said it would raise my riding to a new level. She was right. Mount Fromme was a stunning place to cut our teeth during that first week. 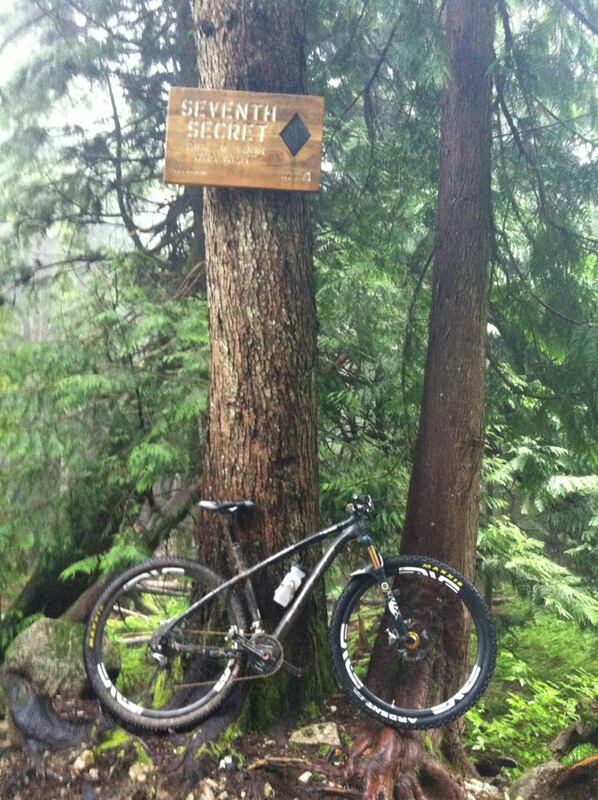 Seventh Secret is my new favourite piece of trail in the whole world. It's like the most technical parts of the cross country trails in Fort William pieced together and extended to one whole kilometre of technical XC goodness. Amazing. So, pre race week was a lot of fun. Then the business end of things kicked off two days ago. 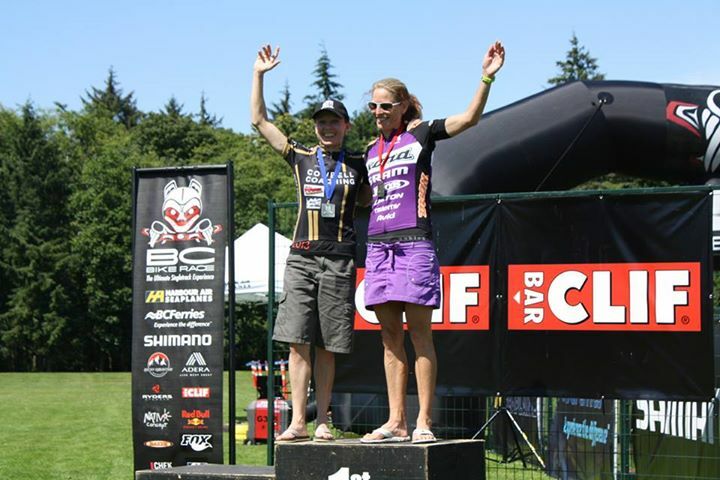 The first day, Day Zero, of BC Bike Race is traditionally a travelling day across to Vancouver Island. The weather turned warm just in time for the race start and I have to say these are the hottest conditions I have ever raced in aside from the World Champs as a young whippersnapper in the junior ranks in 1996. I'm pretty sure that Aussie acclimatisation period has faded over the last 17 years but for a kid who grew up riding in Welsh weather, I'm doing pretty well. Day One. What can I say. There are some riders whose achievements and personalities are such that they become notorious in cycling. Wendy Simms aka the Queen of Lean is one of those characters. 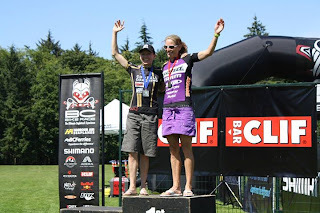 She destroyed the women's field at last year's BC Bike Race and I will happily admit I have a photo of the six time Canadian CX Champ ripping up the cyclocross circuit hanging on to Katerina Nash's rear wheel sat on my desktop computer. I was fully expecting some schooling in Canadian racing during this trip. Add in the current Swedish XC Champ and a bunch of other pinners in the field of solo women and it was tricky to know how it was all gonna pan out. Day One was certainly going to be the way to find out. You know you're in North America if a marching band kicks off the proceedings! Pre race nerves for a whole week's worth of effort were soon out of the way and the race was on. That schooling in Canadian racing I mentioned earlier was dished out within the first ten kilometres of racing on Bevan's Trails, a particularly rooty piece of singletrack. While the roots on Fromme offered decent traction, their cousins in Cumberland had missed the memo. Nevertheless, I kept rubber side up and settled into it. On the long slog up Forbidden Plateau - a seven kilometre gravel grind - I passed Wendy. I couldn't believe it! First, I caught sight of her. Then I realised I was catching. Then I was passing. Then I was gaining time. 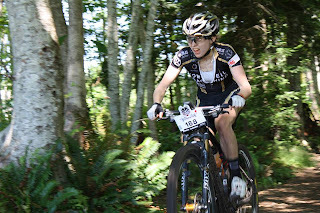 I was pretty sure she'd be on the gas on the descent so tried to keep the pace on down the first Enduro section and scored a top three chick's time on my hardtail! My dropper seatpost is my new best friend forever. Somewhere on a narrow piece of track well adorned with local foliage, I missed a turn. I kept going hoping to see the distinctive pink ribbon to rid a sinking feeling I had that I was off course as the trail became narrower and more overgrown. Sadly, a clearing in a trail appeared before any pink ribbon. I got back on course and at a crossing point a marshall enthusiastically yelled out, "Second woman, only 30 seconds down". Dammit! I chased hard to get back up to Wendy and we rode at a sweet pace together gaining some places in the overall standings in the process, but ultimately that hard effort of closing the gap cost me time in the last ten kilometres. A friendly Aussie who was enjoying some trans-Tasman banter said, "Come on! Don't let her out of your sight!". I replied, "She already is!". Time for less talking and more damage limitation. I crossed the line two minutes down. Who knows how long that wrong turn cost me, but hey, that's racing. While I'd like to think it was two minutes I suspect it was closer to one and I'm happy to take some lessons on riding your bike like it's all floaty and light over technical rooty bits, which Wendy does incredibly impressively. To be able to rock it with her in a race has made my year. Today, was Canada Day. I wore special socks with a cool maple leaf on them. Stealth Canadian. Maybe that will make me more floaty over the roots. 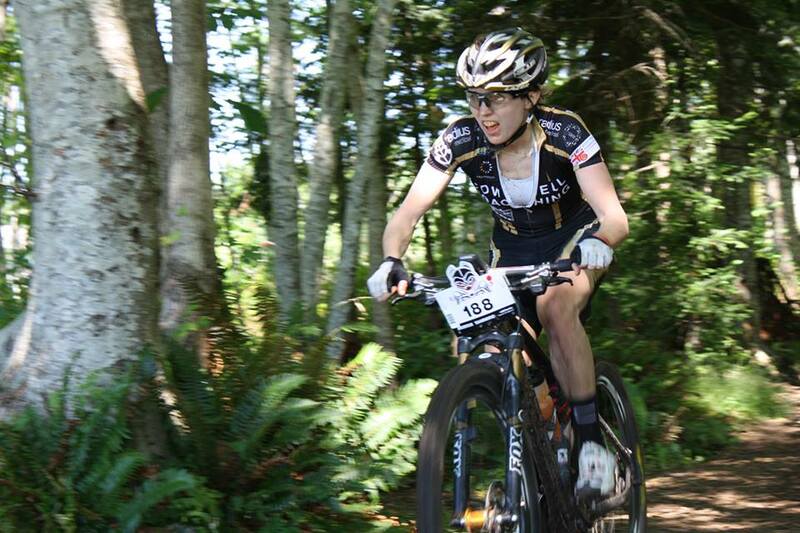 Stage Two was a point to point race from somewhere in the woods near Cumberland to Campbell River. It promised to feature less climbing but an amazing 35 kilometre section of singletrack. Boo to less climbing. Having finished in the top 50 riders overall the day prior, I had the dubious honour of a "red group" start. Red was right. The gently downward trending gravel road start combined with red mist resulted in my GPS telling me we clocked the first eight kilometres in 13 minutes. The pace felt hard. A slightly more steep climb which was loose in spots allowed me to almost get on to Wendy's wheel before she pulled away on the first gnarly descent. 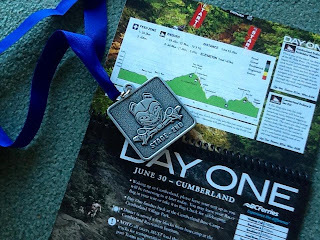 With almost all of the climbing done for the day early on, I was keen to keep riding smoothly and put in a time trial effort in the last 4 kilometres of the race which was paved or gravel roads to round off the day. Mission accomplished. On the gas with 100 metres to go! So, here I am. 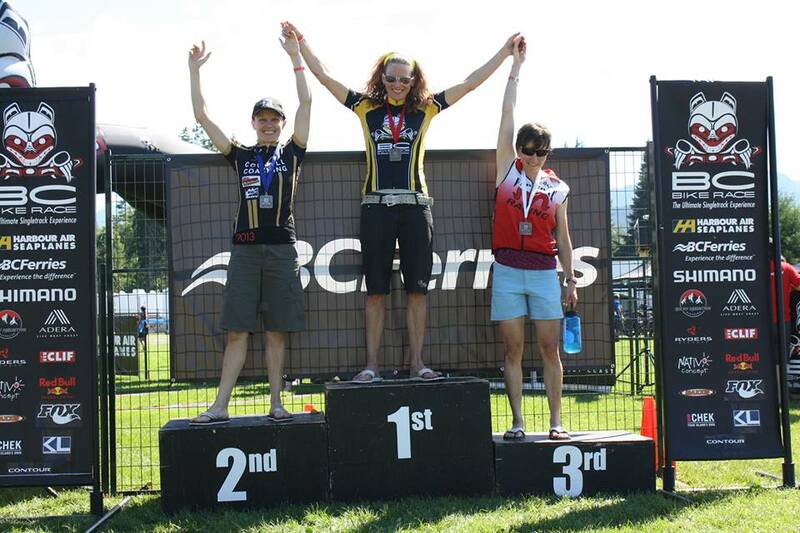 Two second place stage finishes. 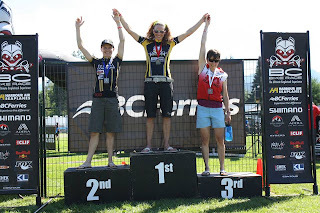 Second solo woman overall. Lead on third consolidated today. Another flatter stage tomorrow then into more climbing as we head from the Sunshine Coast towards Whistler. There's the small matter of consuming some 4,000 calories a day to stay on top of my game. Better get on to it.